In 2017, Durham remained the second cheapest option for housing prices in the GTA, as house prices in Toronto were 99 per cent higher, Halton Region 69 per cent, and York Region 67 per cent. Over the past year, the real estate market has seen sales numbers and average selling prices drop considerably from record levels over the previous few years. However, some analysts say the situation is not as dismal in Durham Region as some of its larger GTA counterparts. According to the region’s 2017 building activity data, prices continued to skyrocket last year. The average price of a new single-detached dwelling in Durham was up 14.2 per cent from $548,268 in 2016 to $626,256 in 2017. The average price in Oshawa was up 15 per cent to $585,041. In 2017, Durham remained the second cheapest option in the GTA, as house prices in Toronto were 99 per cent higher, Halton Region 69 per cent, and York Region 67 per cent. Average prices in Peel were 15 per cent higher, while Hamilton was half a per cent cheaper. But as the calendar flipped over to 2018, house prices began to decline, with the average selling price in Durham falling by more than $12,000 over the previous year to $597,485 in May 2018. 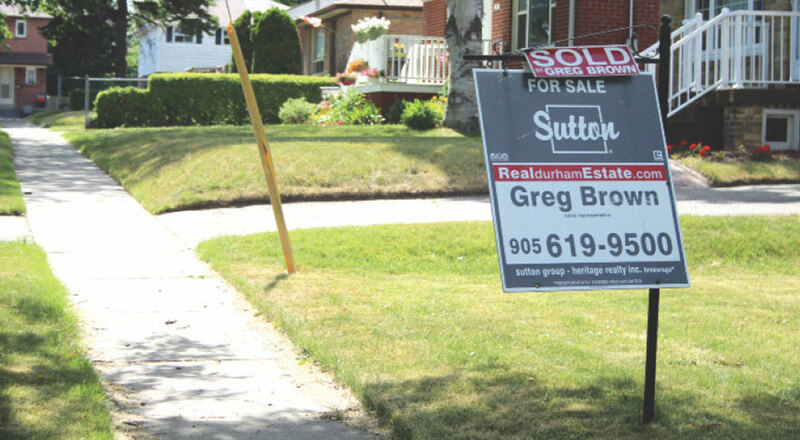 According to the Durham Region Association of Realtors (DRAR), year-to-year sales were down 33 per cent by the end of May. But the month of June brought some good news according to DRAR president Dennis Roberts. “What’s happened in June, the number of transactions has gone up 6.9 per cent, with a total of 918 transactions,” Roberts says. As for sale prices, they were up slightly by 2.2 per cent last month. Roberts says in the currently more-balanced market, sellers must ensure they judge the value of their property correctly from the beginning. Senagama believes price drops can be attributed to buyers being less aggressive and searching for more affordable options such as condos and townhouses. Krystyniak says the former-Wynne government implemented measures to slow the housing boom down, such as the Ontario Fair Housing Plan, but was unsure of the true benefit. “It’s hard to tell if the measures introduced caused the slow down. Interest rates have increased, that definitely could have contributed,” Krystyniak says.